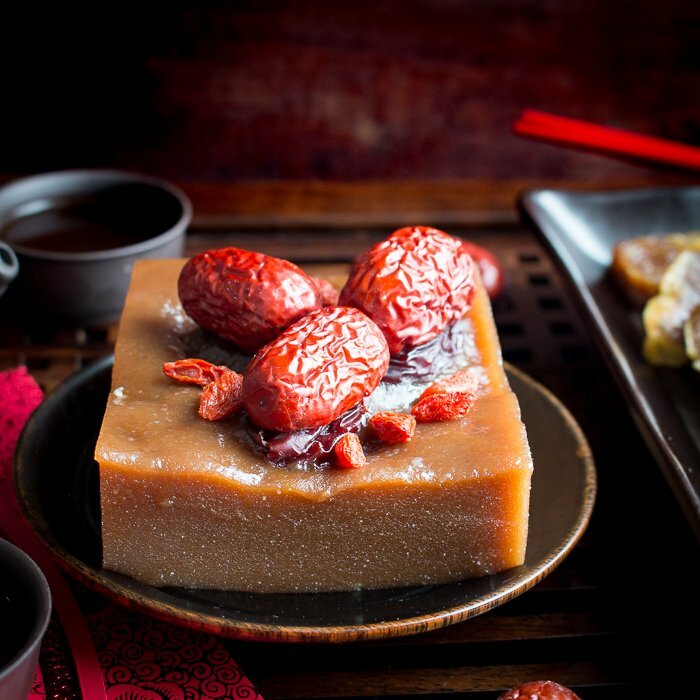 Sweet Sticky Rice Chinese New Year Cake, also known as nian gao, is a Chinese New Year (CNY) treat that is first steamed and then pan fried in egg. Delicately sweet, chewy on the inside and crispy on the outside- simply delicious! We have been simply craving this delicious treat and wanted to make sure you had the recipe in plenty of time for the Chinese New Year (Lunar New Year). Sweet Sticky Rice Chinese New Year Cake is completely addictive due to it's texture and sweetness. Have you ever tried Japanese mochi? This is firmer when cool but it becomes tender on the inside and crispy on the outside when pan fried with egg. 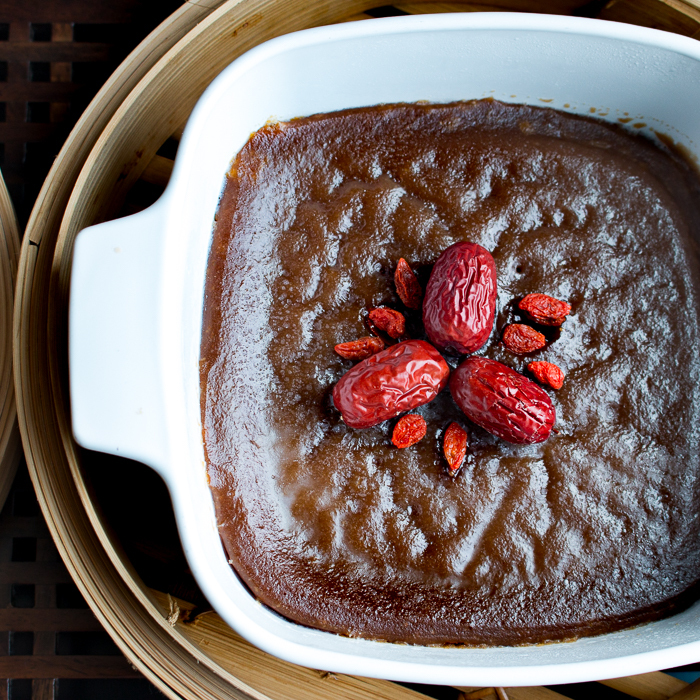 Sweet Sticky Rice Chinese New Year Cake is gluten-free and dairy-free. Glutinous rice flour is the main ingredient in this recipe and it has warming effect on the body. Glutinous rice flour is slightly sweet and can help nourish the spleen and stomach according to Traditional Chinese Medicine (TCM). Check out our article on Introducing the Five Energies of Food to learn more about this concept. 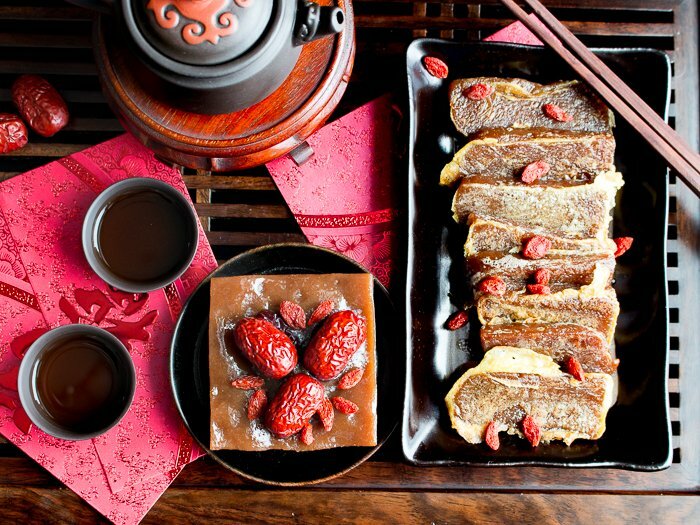 This Cake is also called "nian gao" in Mandarin and "nin gou" in Cantonese. 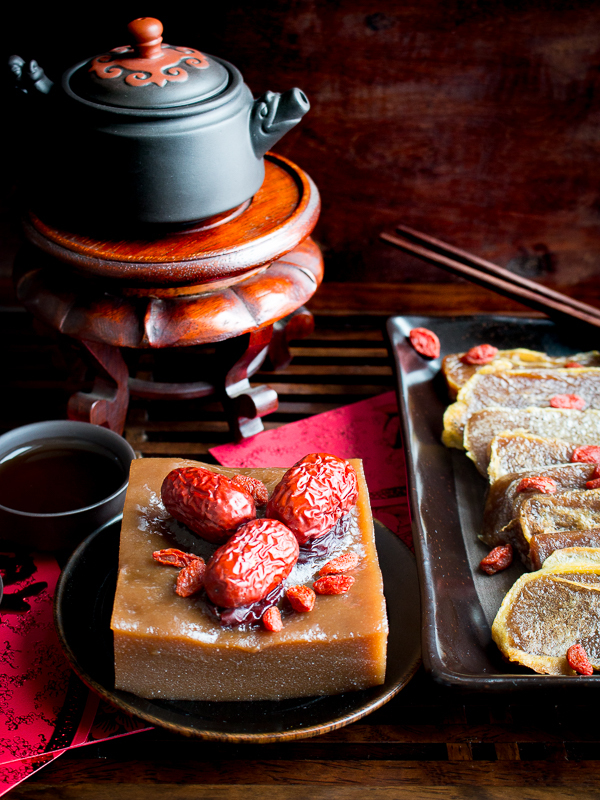 You are probably wondering why the nian gao is a very common treat served during the CNY. Sweet Sticky Rice Chinese New Year Cake symbolizes good luck and a higher year. You see “nian gao” is a homonym for "higher year." The Chinese word 粘 (nián), means "sticky" and it is identical in sound to 年, which means "year”. The word 糕 (gāo), which means "cake" is identical sound to 高, which means "high or tall". So, there you have it boys and girls--- a great excuse to eat cake. Like we needed an excuse to eat cake, lol….. but now we do! Bring it on!!! 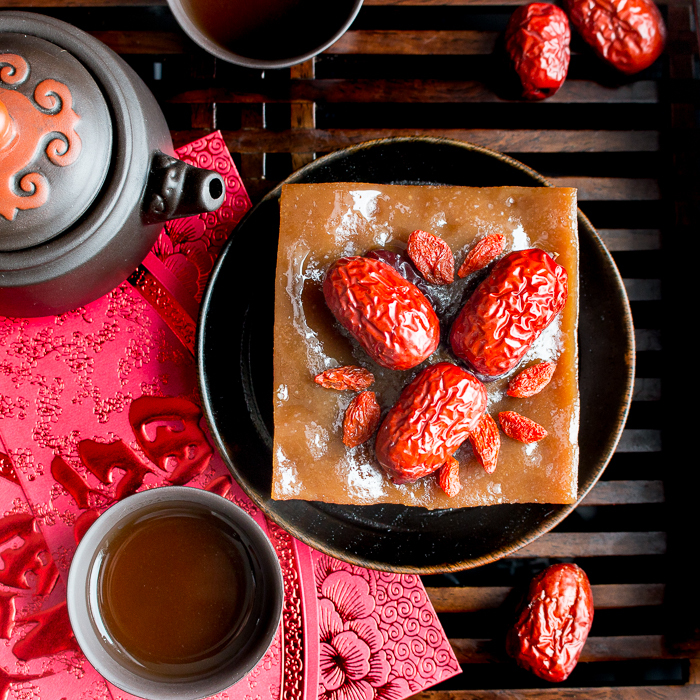 We could always use a little extra good luck, so let’s eat nian gao. Chinese New Year is all about making the new year luckier, wealthier and in good health. There are many traditions that are part of the Chinese New Year Preparation. We are now in the process of Deep cleaning our home to remove the old and welcome the new. We are decorating our front door with Chūnlián (春聯). These are long, narrow red strips of paper or diamond-shaped paper printed with black or gold Chinese characters. 富 (fù): Fortune and 春 (chūn) Spring. These are usually hung upside down because the Chinese word 倒 (dào, upside down) sounds the same as 到 (dào, arrive). Therefore, it symbolizes the arrival of fortune and spring. Trust me the sooner Spring can come to the brutal cold weather of Michigan we are all about that!!!! Keep your family traditions alive no matter where on this globe you have landed. Going to the flower market is for sure to be on our to do list. We love decorating our home with lucky plants and a favorite is the tangerine tree which is a lucky plant bearing fruits. One of our favorite flower markets is Hong Kong (HK). This flower market is held annually in Victoria Park in Causeway Bay starting a couple of weeks before the New Year and running up until New Year's Day. If you are in HK, our suggestion is to go as soon as they open in the day so you don’t have to fight the crowds. It gets so crowded in the afternoon you can’t even move or you must travel in the direction of the crowd only. We are also preparing our "lai cee" (little red packets) to give to all of those that were good to us through the year and for the children. Chinese New Year is one of the biggest migrations of people in the world because everyone wants to do these two things. Be sure to check out our 10 Fun and Easy Chinese New Year Recipes , Ginger Chili Fish Stir Fry and our article on VRAI Magazine for Chinese New Year feast ideas. In Hong Kong, China, Taiwan, etc. you can see Chinese New Year cakes (nian gao) everywhere already prepared in cute little boxes because many people give them as gifts. However, this recipe really is delicious and has only a handful of ingredients, so it can be made at home no matter where you are on the globe. You can steam in little aluminum pans and give as gifts too. This recipe makes 2 (6 in x 6 inch) cakes or about (15 cm x 15 cm) cakes. If you are going to go through the process of making Chinese New Year Cake, you might as well make extra and bring as gifts to family and friends. 2) You can find glutinous rice flour in Asian Markets or even on amazon. Rice flour is NOT the same as Glutinous rice flour. (FYI- just because the ingredient has the word “Glutinous” it does NOT contain gluten. It is gluten free, it gets Its name as this special type of rice flour gets sticky when it is cooked.) However, for all our Celiac followers out there, you need to confirm that the glutinous rice flour is made in a gluten free facility without cross contaminants during its production. 3) We used dark brown sugar as we did not have Chinese rock sugar. However, if you have access to Chinese rock sugar, use it. 4) We have not tried to make this recipe with a sugar substitute and would not recommend doing so as it would just not be the same. 5) We tried using coconut oil instead of canola oil as we only had olive oil at home. You do NOT want to use olive oil or any other strong flavored oil. Canola is best but coconut oil added a delicious delicate taste of coconut flavor. However, the downside is when coconut oil is chilled it solidifies, so best to keep with the plain canola oil. 6) In some countries, they prefer to add a little coconut milk/cream in exchange for some of the water for a richer taste. This is all up to you. What you need to keep in mind is keeping the total amount of dry ingredients and wet ingredients per the recipe for the best results. 7) One of THE most important steps in removing the lumps from the batter. There is no need to strain. You need to let your sugar mixture come to room temperature. Mix the wet sugar mixture into your dry ingredients just a little bit at a time. If you dump in all at once, you WILL have a lumpy disaster and then you will need to strain. Make sure your sugar water solution is room temperature. 8) The goal is to have a mixture that is very similar in texture to maybe sweetened condensed milk or thin cement paste. Therefore, it is important to weigh with a scale instead of use measuring cups. 9) We know that 400 grams of brown sugar (about 2 cups) sounds like a lot and it is but it is still just delicately sweet when served. You can try to add vanilla or other flavor agents like sesame if you want to try to decrease the sugar. 10) Make sure to get the bubbles off the top. 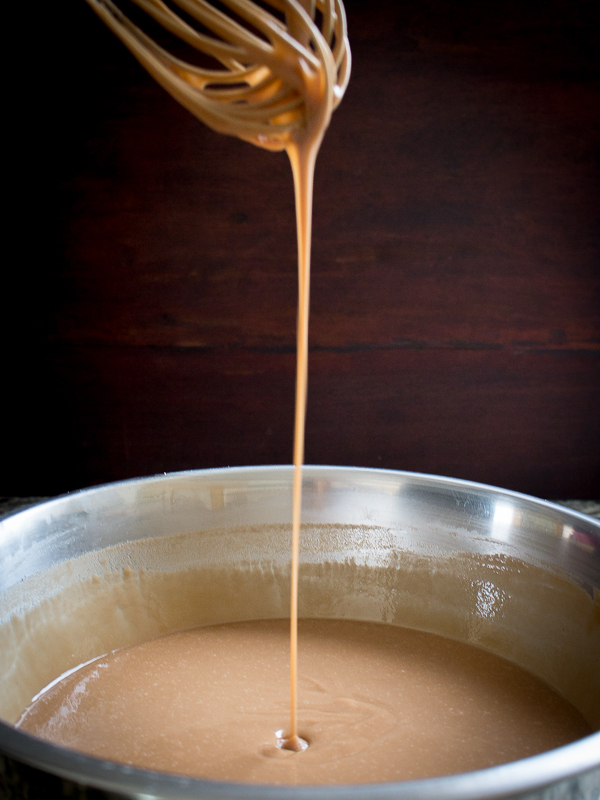 When you pour your Sweet Sticky Rice Chinese New Year Cake (nian gao) batter into the “Greased” dishes, do it slowly. Then leave them rest for a moment to allow all the bubbles to rise to the top. Any remaining bubbles can be burst with a toothpick. Of course, this is just an aesthetic step and not required. It just makes for a prettier cake. 11) We kept to the traditional flavors with minimal ingredients but feel free to add whatever your little heart desires. Vanilla is nice. 12) If you have a steamer basket then make sure you cover the lid with a clean tea cloth to capture any moisture so that it does not land on the cake. It gives a smoother top appearance. 13) If you do not have a steamer basket, you can create one up like we did. We used a wok with a lid and at the bottom of the pan you can either cross 2 chop sticks or turn a little bowl upside down, add water to the wok and place your cake on top in a container that will fit with the lid. We also wrapped this lid in a tea towel so no droplets of water got in. The best fitting steamer devices do not let any steam escape. 14) This recipe makes 2 Chinese New Year cakes. One for you and one for a gift. How perfect is that! 15) Toppings whatever you little heart desires. However, just add them on top during the last part of the steaming process. We chose Chinese red dates and goji berries. 16) The Chinese New Year (CNY) cake is done when a toothpick comes out clean. Depending on how well your steamer basket is working and not allowing any steam to escape this can be anywhere between 1 hour to 1.5 hours or so. Our cakes took 1.5 hours to cook. 18) Sweet Sticky Rice Chinese New Year Cake is super sticky. To remove the cake from the greased pan, you must run your knife under cool water frequently. To get your cake out of the pan, run your knife several times around the edges. Then, grease a spatula and your fingers with a little canola oil. Wedge the spatula under the cake and gently pull up and out of the pan. Before setting the cake on your cutting board slather a little oil on the bottom of cake to prevent sticking. 19) Slice your cake in about 1/8 inch thin slices and with each slice dip your knife into cold water. 20) You can eat the cake just as it sliced but it is 100 times better dipped in egg and pan fried each side and served warm. Seriously delicious and so simple to do. Remember, use a little oil in your pan as you are dealing with “sticky rice”. 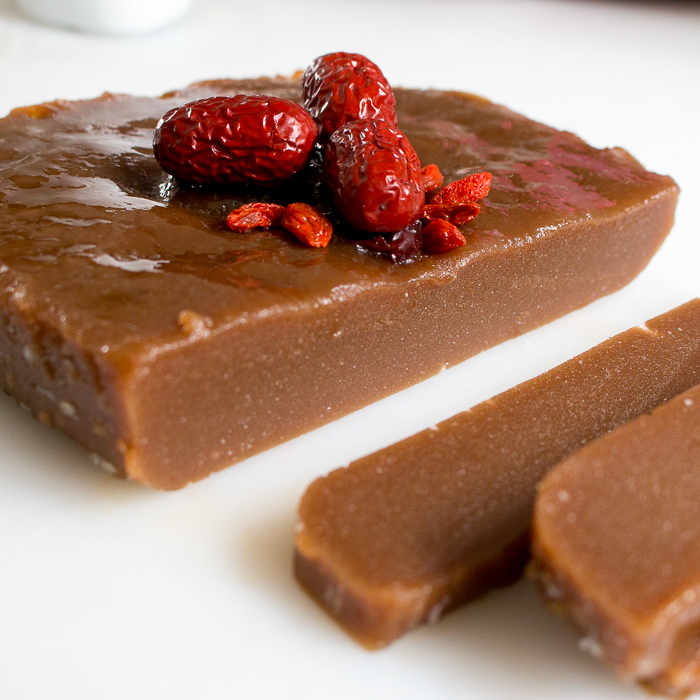 21) Sweet Sticky Rice Chinese New Year Cake (nian gao) will keep in the refrigerator and we recommended consuming within 3 to 4 days of making it for best results. 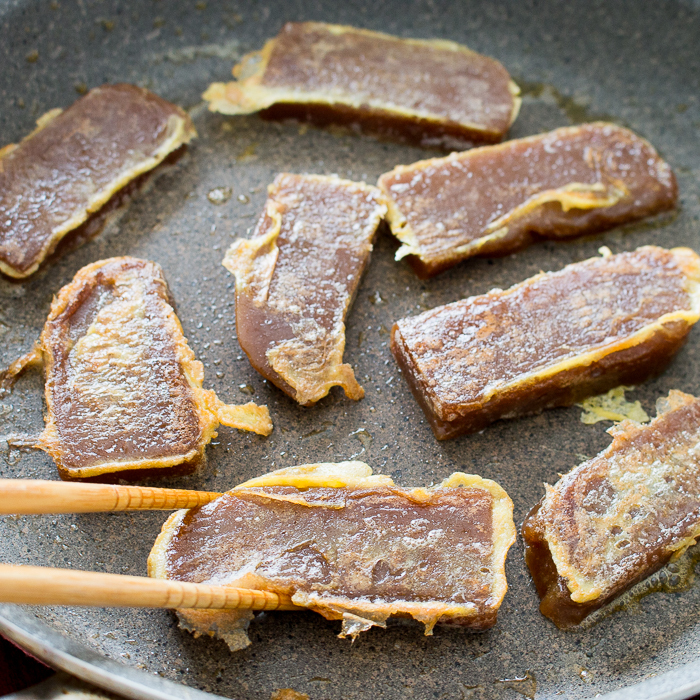 You can freeze your nian gao.!!!!! EPIC DISCOVERY!!!! Cut your cake into large sections that you and your family would eat at one sitting. Freeze in sealed plastic container or sealable baggie. When you are ready to enjoy your Chinese New Year Cakes take out a section and microwave for 10-20 seconds at a time until just until slightly pliable. Slice and dip and egg, fry and enjoy! Woo hoo! 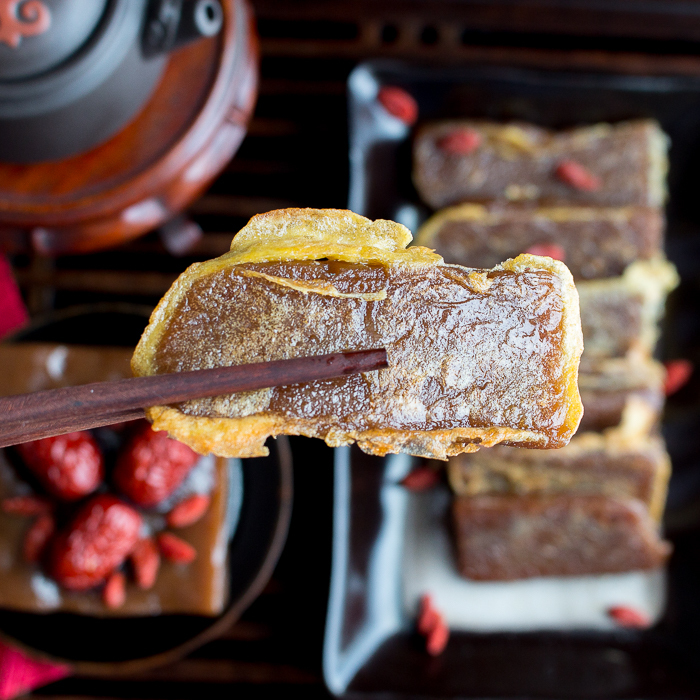 So now you can make nian gao in advance and eat it along the entire length of Chinese New Year without worrying about having to finish the cake in 3-4 days. You CAN store in freezer, then like x-mas cookies, just take out a serving just before using. Water – 675 grams (or about 3 cups) – if you like a coconut flavor try exchanging part of water for coconut milk. 1Place water and sugar in sauce pan over medium low heat to melt the sugar and have no sugar crystals remaining- stir. Do Not boil. Remove from heat and allow to cool to room temperature. 2In a large bowl, sift in glutinous rice flour and rice flour. SLOWLY add a little of the room temperature sugar water a little bit of time and mix well with a whisk. Then, add a little more sugar water and whisk well to remove lumps as you go. Maybe about 5-6 separate additions of the sugar water addition to the dry ingredients. 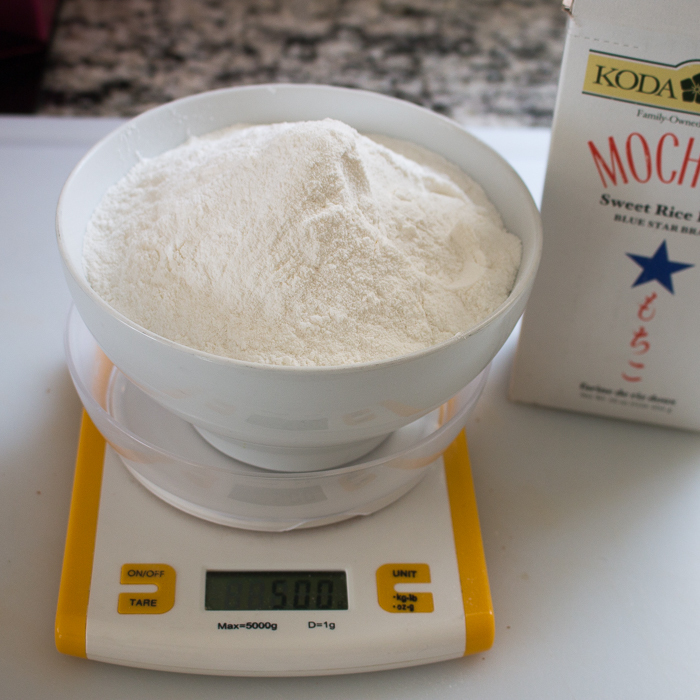 Depending on your due diligence to weigh your ingredients properly and the climate being more humid or dry outside you will keep adding the sugar water mixture to the dry flour mixture until it is the consistency of sweetened condensed milk. Whisk well to remove all lumps. 3Prepare your steamer vessel. If you have a traditional wicker steamer make sure to wrap the lid with a clean dry tea towel. This helps prevent any water droplets from landing on top of your Chinese New Year Cake. Place a few inches of water in the bottom of the pan. (we used a big soup pot) that fits the diameter of our steamer basket. If you do not have a steamer basket, you can make your own using items in your kitchen. All you need is a big pot with a lid that fits and a smaller container that will fit inside to hold the Sweet Sticky Rice Chinese New Year Cake and allow the lid to close. We used a wok. Inside the wok (or other large pot) you can either use 2 chopsticks that crisscross on the bottom of the pan or a small dish placed upside down on the bottom of the pan to be able to support the dish with your Chinese New Year Cake out of the water at the bottom of the pan. 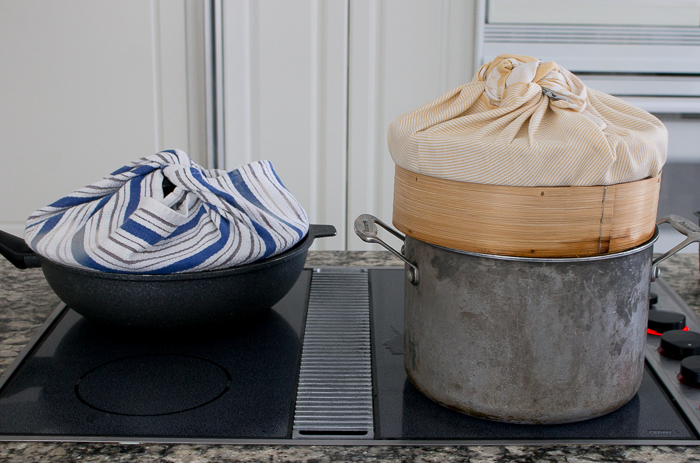 Fill your wok or cooking vessel with a few inches of water on the bottom. Place a tea towel around the lid to prevent condensation from contacting the top of the cake. Close the lid and over medium high heat allow the steamer to come up to temperature. You do not want the water to boil but just a heavy simmer. 4In the meantime, find a dish, flat bowl, loaf pans or even those disposable aluminum pie pans work great (especially if giving away as gifts). You want to pick a bowl/dish that will fit inside your cooking vessel and allow the lid to seal completely. We had two little 6 x 6 baking dishes that fit in ours perfectly. 5Grease your baking dish with a little canola oil on bottom and all sides. Pour half of the Chinese New Year Cake batter into one dish and half of the batter into the other dish slowly. Allow the batter to sit a moment to allow the bubbles to rise to the top of the dish and then pop the bubbles with a little toothpick. Not a required step but makes your cake look pretty. 6Place your prepared Sweet Sticky Rice Chinese New Year Cake into the steamer and steam for about 1.5 hours or until the toothpick comes out clean. 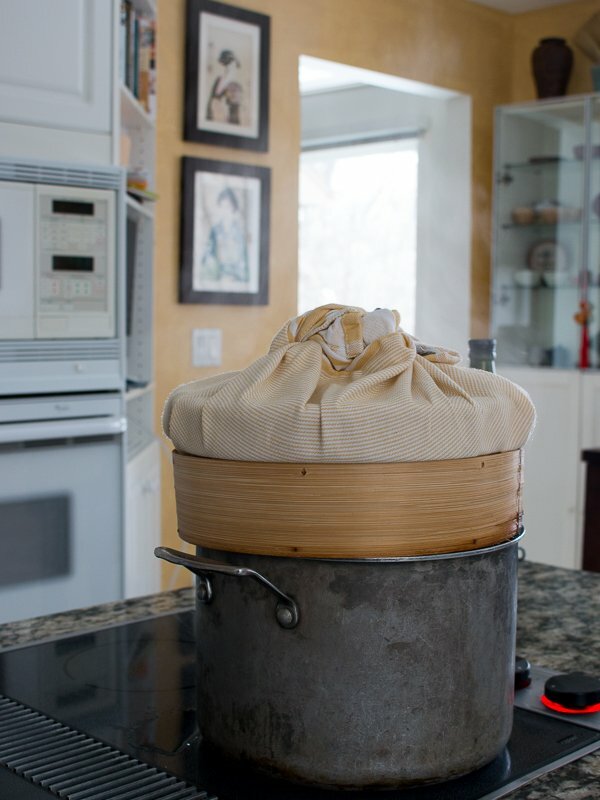 The amount of time for steaming depends on how efficient your steamer is. If you have an ill-fitting lid or a lot of steam is escaping then you will need more time. (Please note! Check on your steamer part way through and you may need to add a little additional water to your cooking vessel). Be careful to not get any water on your cake. If you have a super-efficient steaming vessel, your cake may be done after 1 hour. 7If you wish to add any decorations to the top of your Sweet Sticky Rice Chinese New Year Cake such as Chinese Red Dates or goji berries do this the last 10-15 minutes of steaming. 8Once your toothpick comes out clean, your Sweet Sticky Rice Chinese New Year Cake is done. Carefully, with hot pads, remove your cakes from the steamer and allow to come to room temperature. Once your cakes are room temperature, cover with cling wrap and place in the refrigerator overnight. IMPORTANT STEP: You MUST place your Sweet Sticky Rice Chinese New Year Cake in the refrigerator overnight or they will be too sticky to cut and enjoy. 9Take your Sweet Sticky Rice Chinese New Year Cake out of the refrigerator and run a butter knife several times around the edges. Each time dip your knife in a glass of cold water to prevent sticking. Next, place a little oil on a spatula and on your fingers and gently pull the Chinese New Year cake up and out of your cooking dish. (Needs a little persistence) Rub the bottom of the cake with a little bit of the oil before setting on a cutting board to slice. 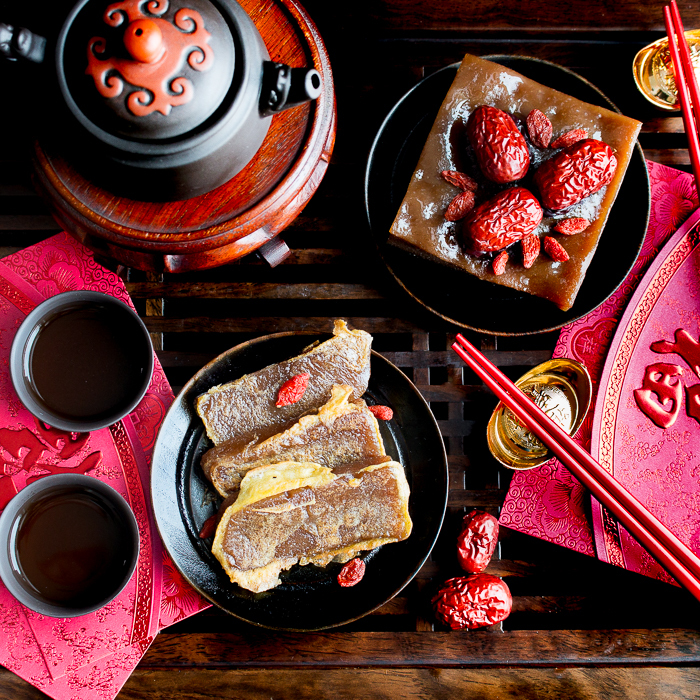 Slice the Chinese New Year Cake (nian gao) with a knife and each time dip your knife in cool water to prevent sticking. Cut it in about 1/8 inch slices. At this point, your Chinese New Year cakes can be eaten as is, but why when you can make it taste even better!!!! 10These Sweet Sticky Rice Chinese New Year Cake are 100 times more delicious by dipping the Cake thin slices in a little beaten egg and then pan frying then in a little canola oil for about 2 minutes on each side. Just until a little crispy on the outside and chewy and delicious on the inside. 12*** Best enjoyed within 3-4 days of preparation. Must be stored in refrigerator. 13*** You can freeze your nian gao.!!!!! EPIC DISCOVERY!!!! Cut your cake into large sections that you and your family would eat at one sitting. Freeze in sealed plastic container or sealable baggie. When you are ready to enjoy your Chinese New Year Cakes take out a section and microwave for 10-20 seconds at a time until just until slightly pliable. Slice and dip and egg, fry and enjoy! Woo hoo! 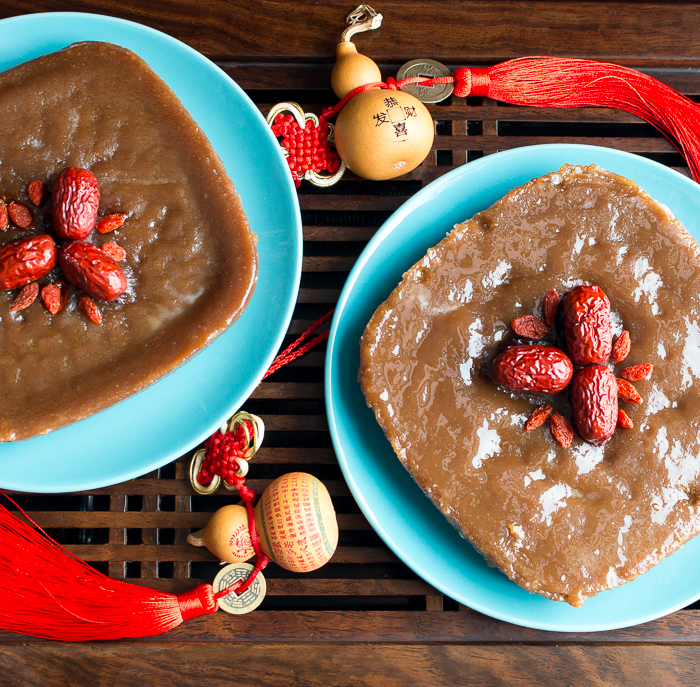 So now you can make nian gao in advance and eat it along the entire length of Chinese New Year without worrying about having to finish the cake in 3-4 days.